On the occasion of World Diabetes Day here comes my next diabetic friendly lunch in a banana leaf (though cannot find a real one this time). This lunch has Beetroot stir fry, Moringa Leaves Curry (Murunga Keerai /Drumstick leaves curry), Paan chutney, Tindora Raita , Kandathipli Rasam (A soup with country herbs, Mango Ginger Pickle, a cup of Low GI Basmathi rice and a small claypot with curd. The meal also comes with a cup of claypot water which was kept overnight to get the chill feel. When there are wonderful platter ideas for festivals, there are healthy platter ideas for diabetes day too. 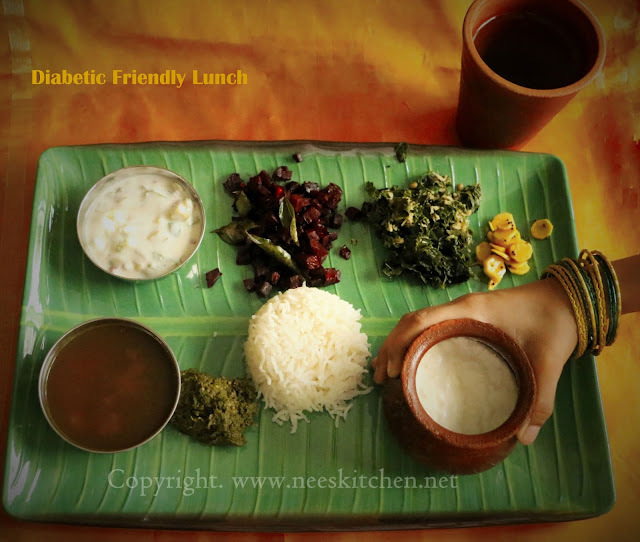 Anyone can have this meal, hence enjoy this meal along with those in your family who have diabetes. 1. Water was soaked overnight in the claypot. 2. Yogurt was prepared at early morning 6:00 am in a small claypot. With claypot the curd happens in few hours of time and you need not keep them in fridge. 3. 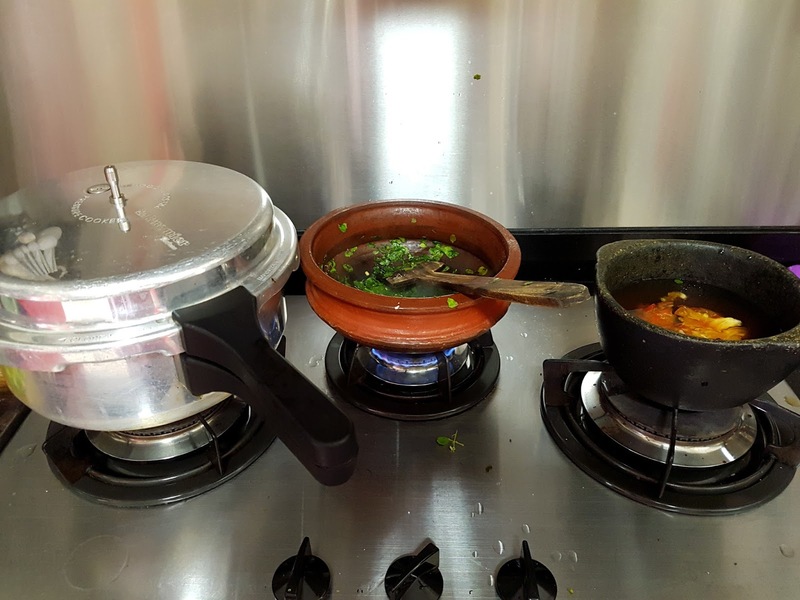 I prepared rice, rasam and murunga keerai in parallel. I buy murunga keerai /drumstick leaves/ moringa leaves in bulk and store them fridge. Hence there is not separate work required to sort these leaves from the stem. My original kandathipli rasam does not have tomatoes , I just added to this one. 4. Tindora raita is done in microwave, hence can be done in parallel. Yogurt is always available in our home hence I did not plan to prepare yogurt for this dish. 5. Beetroot curry and paan chutney were done in parallel once rice , rasam and murunga keerai poriyal was over. 6. Maa Inji - Mango Ginger pickle was readily available.